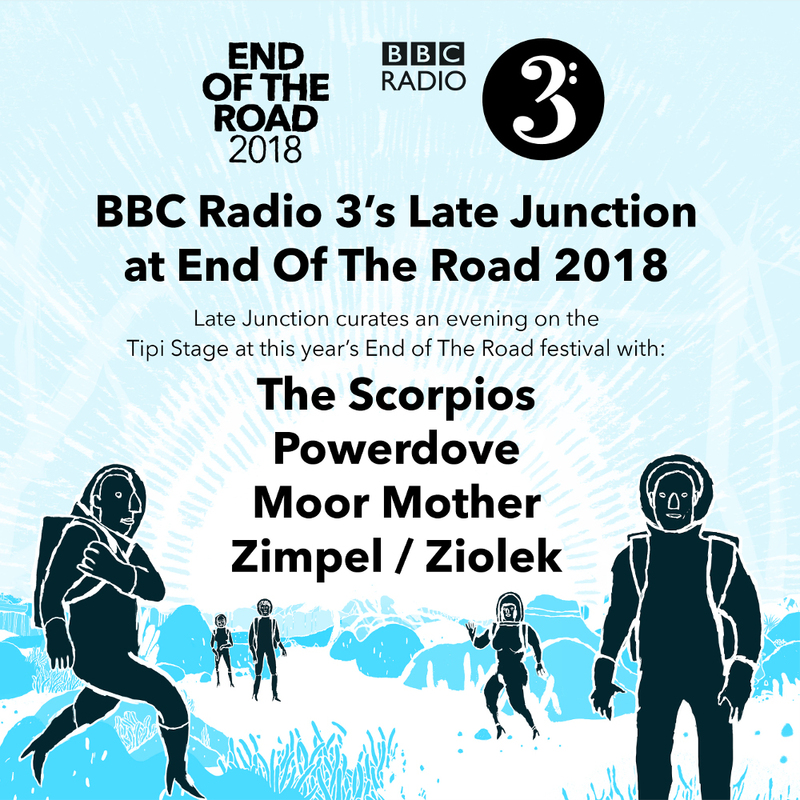 BBC Radio 3’s flagship experimental music programme, Late Junction, returns to End Of The Road festival this year, following the partnership’s successful debut in 2017, curating a range of ground breaking and exciting artists from around the globe. Once again, four carefully selected artists will perform on the Tipi Stage as part of the festival’s Friday night line up, hosted by Verity Sharp. Moor Mother is the experimental music project of musician, poet and visual artist, Camae Ayewa. With ecstatic acclaim for her debut album Fetish Bones — named one of the albums of the year by the likes of Pitchfork, Rolling Stone, and The Wire — Moor Mother uses hip-hop, samples, spoken word and free jazz to create space-time bending sound, resulting in a DIY twist on the Afrofuturism of fellow Philadelphia artist-philosopher Sun Ra. Ten piece psychedelic Sudanese Afrobeat ensemble The Scorpios first arrived in the UK in the 1980s as refugees and now consist of members from all over the world supported by an international backing band of musicians from Ghana, Jamaica, Poland and Japan. Influenced by traditional Sudanese songs and 1960s pop, their unique blend of Eastern funk, Arabic rhythms and reggae makes for an exhilarating live show. Multi-instrumentalist, composer and academic Annie Lewandowski is the beating heart of international ‘eclectic folk’ outfit Powerdove. Bolstered by band members Thomas Bonvalet and Chad Popple, Powerdove reference everything from the classical avant garde, 1970s prog folk and 1980s post-punk. Combining improvisation with unconventional instrumentation, the adventurous trio produce a wildly unpredictable and captivating live show. Zimpel / Ziolek is the coming together of two leading multi-instrumentalists from Poland’s fertile experimental underground. Fusing the modern jazz minimalism of Waclaw Zimpel with Kuba Ziolek’s traditional folk leanings, the duo’s extraordinary record What Goes Around is a masterclass in musicianship, filled with astounding clarinet solos and hypnotic guitar work. End Of The Road is thrilled to host Zimpel / Ziolek’s UK festival debut. Recordings of all performances will be broadcast on BBC Radio 3’s Late Junction on the 11th, 12th and 13th September from 11pm.